First of all we should know why our site is loading Slowly , This Helps us great in WordPress Optimization , As nowadays the web pages consist of lots of images , CSS , Java Script and many More Multimedia Stuff which affects bandwidth, so for that we need to keep it optimized . Now Run Page Speed and Check which all factors make your site load slowly. Page speed gives your site performance rating from 0-100 in that try to get rating around 80. Try to keep your Page size around 100kb or less. If you found that their is no problem in your plugins then try verifying about your theme has theme consist of many multimedia things and Java Scripts , CSS and Images they may slow down your site , So to verify change your theme to something else or Default WordPress Theme. As suggest default wordpress theme Twenty Ten is nice and is mostly optimized for performance. So you can switch to default theme and check if your theme have any problem. WP-DBManager is a plugin by Lester Chan that manages your database and you can scheduled your database optimization and Repair. 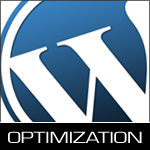 In WordPress Optimization Cache also holds a great importance. Cache is a component that transparently stores data so that future requests for that data can be served faster. The data that is stored within a cache might be values that have been computed earlier or duplicates of original values that are stored elsewhere. If requested data is contained in the cache (cache hit), this request can be served by simply reading the cache, which is comparably faster. Otherwise (cache miss), the data has to be recomputed or fetched from its original storage location, which is comparably slower. Hence, the more requests can be served from the cache the faster the overall system performance is. You can use some Plugins for cache like W3 Total Cache is Really Rocking nowadays. it will help you a Lots that Guaranteed 100% . Expire headers tell the browser how long it should keep the content in cache which is efficient for WordPress Optimization. Most of the images on your site never change and it is good idea to keep them cached locally. When ever a site loads the browser uses only 2 - 3 parallel downloads per domain . So if you use more domains to download the content of your site like Java Script , CSS , images and etc. you will get more parallel downloads and then your site will load more quicker. Experience a Faster wordpress blog that loads with in blink of the eyes , if you work hard on WordPress optimization you can make your blog load faster then google and thats possible. If you like then do share it please and also Subscribe to get more WordPress Optimization tips.